SPIRIT POWERSTATION is the basis of a complete sound system, combining a high quality Mixer, Effects Controller, Graphic Equaliser and Power Amplifier in a single unit. POWERSTATION incorporates circuit technology identical to that used on some of the most sophisticated Soundcraft consoles. The mono input channels are able to accept a wide range of Microphone and Line level signals from separate input sockets. Every mono channel features wide range gain control, 3-band Equalisation with swept Mid section, plus a Hi-Pass Filter, 2 Auxiliary Sends, one of which may be switched to a dedicated FX bus to feed the built-in Lexicon Effects Controller, PFL(Pre Fade Listen) and panning to a Stereo Bus. Each channel has a pre-EQ, pre-fade insert point and is controlled by a high-quality linear fader. POWERSTATION is provided as standard with a pair of stereo inputs. Each stereo input includes a 3-band fixed frequency EQ and similar facilities to the mono input. The Master section provides master faders for the Left and Right outputs, plus a fader controlling the mix to the Lexicon Digital Effects Processor, the output of which feeds back into the main mix. 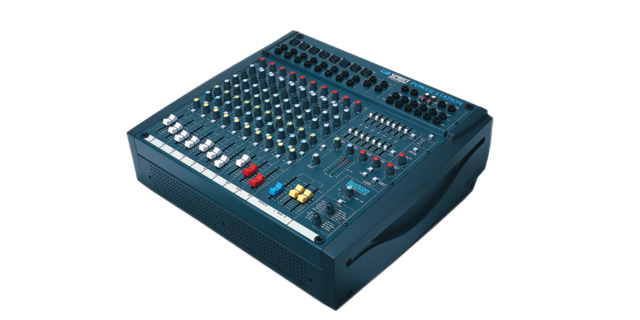 Master level controls are provided for the Auxiliary Sends and Stereo and 2-Track Returns, and headphone listening and LED bargraph metering is included to monitor the main mix or PFL signal. A Mono output is provided which sums the post-fade Left & Right signals to mono. A built-in 7-band Graphic Equaliser offers precise correction of the output signal if required, and is normally patched into the input to the integral power amplifier.